Peter Apostolou might not have been the biggest name in the room today but he certainly showed the most composure as he built a big stack early and never looked back. 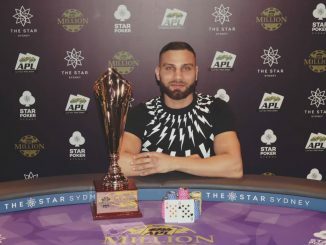 A regular in The Star Poker room, Apostolou survived a marathon 16 hour day as we played all the way down to the winner – eventually building a handy chip lead three-handed before finally finishing off Jarred Graham and Fred Alam just as the sun was threatening to rise on a new day! While former Sydney Championships main event winner Graham was easily the most decorated player at the final table, having just won his first WSOP bracelet in a PLO event in Las Vegas, Apostolou never looked flustered and made a series of disciplined folds before ramping up the aggression as he began to sense victory. He takes home almost $27,000 for his efforts. Apostolou outlasted a field of 99 runners today and the new 6-max format certainly brought out the quality. Among today’s field were the likes of Grant Levy, Aaron Benton, Michael Kanaan, Victor Teng, Andy Lee, Tam Truong and Martin Kozlov. None of them would make the money, however among the 12 players to cash were former Sydney Championships winner Errolyn Strang and Joel Cohen, who final tabled the Star Summer Series main event last December. But it was Apostolou smiling brightest by the end of the day. Congratulations to Peter on a brilliant victory and we look forward to seeing him again through the week as we near the main event. With that in mind, join us back here at Poker Media Australia on Thursday night as we bring you all the live action from the opening Day 1 Flight of this year’s Sydney Championships main event. Fred Alam was so short that when he shipped with J-9, Peter Apostolou had no choice but to make the call holding 8-6. Alam was looking good on the K-J-6 flop but just as he had all day, Apostolou hit when he needed to with the turned 8 giving him two pair. Alam needed a J, 9 or K to steal the pot but the 10 river was no help and his day comes to an end one spot short of glory. Heading into heads-up play, Peter Apostolou holds a commanding chip lead with around 1.1 million to Fred Alam’s 380,000. Jarred Graham was short so when Peter Apostolou opened the button he quickly shipped the reminder of his chips, around 210,000, with A-5. Apostolou called with J-10 and had a thousand outs when the flop came 8-9-3. The turn was a blank 4 but the river 7 gave him the nut straight and saw Graham headed to the rail. We are now heads-up! Luke Spano has just hit the rail after a truly unforgettable hand. Down to just 100,000 in chips, Spano shipped it with 2-2 and was called by Peter Apostolou with A-6. The flop was a huge one for Spano as it came 2-7-7. Apostolou was just about drawing dead until a third 7 arrived on the turn, giving him outs to the bigger full house … or, as fate would have it, with the bigger kicker because incredibly the case 7 landed on the river – sending the entire table into raptures over what they had just witnessed. Still, Spano took the beat with good grace and can be pleased with a tidy day’s work. Shivan Abdene was desperately short and eventually shoved from the button holding J-9. He was called by Jarred Graham in the big blind holding A-8 and the A-5-8 flop just about sealed Abdene’s fate. The 3 on the turn did just that and he heads home with almost $7,000 to add to his bank account. Peter Apostolou has just scored a huge double up thanks to a brutal cooler against Luke Spano. It began with Apostolou opening the button to 20,000 and Spano 3-betting out of the blinds to 35,000. Apostolou called. The flop came 9-K-7 all clubs and both players checked. The turn came the 4c and again both players checked. This is when things got interesting. When the 7 repeated on the river, Spano led for 50,000, Apostolou shoved for 200,000 more and Spano quicky called. Spano held A-J of spades and had flopped the nuts but Apostolou’s pocket 9s had pipped him at the death. Apostolou moves up to 400,000 although Spano is still in the hunt with 300,000. Lior Segre has just been sent to the rail after copping a desperately unlucky beat at the hands of Shivan Abdene. Segre shoved over the top of Abdene’s raise for a touch over 100,000 and Abdene had little choice but to call with As-Js. He needed help to topple Segre’s A-K and the 3h-6d-7s flop didn’t offer much, but when running spades completed the board Segre’s run came to a crashing halt. Michael O’Grady had shoved twice in recent hands and managed to get it through but he ran into trouble third time around when he shipped for 80,000 with 8-8 and ran into the 9s of Peter Apostolou. The board ran out 10-7-2-5-K and with that our final table is set. With seven players remaining, we’ve redrawn and all are seated at the one table to avoid one table being stuck with just three. There is also some discussion about playing through to a winner tonight rather than returning at 4pm tomorrow for the final table. A final decision on that will be made once we reach our last six. Joel Cohen had been clawing his way back into contention but his day has come to an abrupt end at the hands of Shivan Abdene. Cohen raised from the cut-off and was 3-bet by Abdene on the button. Cohen quickly shoved but Abdene almost beat him into the pot with his pocket Aces. Cohen showed K-Q and found no help on the 3-4-5-5-7 board. We’re not down to seven and on our official final table bubble! Xin Jie Lin Shoves his short stack from the button holding Q-8 and was snap-called by Joel Cohen in the big blind. ?? cards were live against Cohen’s A-K but a K on the flop just about had him drawing dead as the board ran out 10-6-K-9-A. Cohen is still clawing away with around 190,000. It’s been slow going here for the past 40 minutes or so but with blinds about to jump significantly from 2000/4000 to 3000/6000 with a 500 ante we could see plenty of action soon. Matt Rolfe hasn’t been able to get anything going over the past hour or so and the rising blinds eventually caught up with him. After Shivan Abdene opened in the cut-off, Rolfe shoved for his remaining 80,000 with K-Q but was in terrible shape against Abdene’s K-K. The board ran out J-high and Rolfe hits the rail. Players are taking a well-earned 10-minute break. Errolyn Strang is our latest casualty here at The Star after choosing the wrong time to ship it. The action was folded around to Peter Apostolou who completed with the 3-4 of diamonds. The flop came Kd-5d-4c and when he checked to Strang she shoved for her remaining 60,000. Apostolou insta-called and was in great shape against Strang’s 7-3. The diamond on the turn cemented the hand for him and Strang’s run comes to an end. Apostolou is up to 340,000 and looking strong after that hand. Blinds are up to 1500/3000 with a 400 ante. We still have 11 players left with five more eliminations until we call it a night! The bursting of the bubble usually sends then remaining short stacks into a frenzy now that they’ve survived to the money but it has taken a while for us to lose our next player. That player is Karl Spiegel, who got his last 70,000 in holding Q-Q and was racing against the A-K of Shivan Abdene. The board ran out A-4-5-2-6 and Spiegel heads home with $2,475 in his back pocket. The bubble has burst as one of our many short stacks ran his A-Q into an opponent’s A-K – we are now officially in the money! The remaining 12 players are guaranteed at least $2,475 although they will all be aiming for the $26,978 top prize. The floor staff is currently re-drawing the tables as we look to play down to our six-man final table. We are now officially on the money bubble following the remarkable elimination of Thang Truong. Truong has been trying to change it up recently and has clashed with Michael O’Grady on a few occasions. He did it again this time in a blind v blind battle that saw Truong shove and O’Grady snap-call. Truong’s face lit-up when he saw that his J-J was in great shape against the Ac-6d of O’Grady but he didn’t love the all diamond flop that have O’Grady a mountain of outs. The Jd on the turn shot O’Grady into the lead although Truong could still reclaim the pot should the river pair the board. It didn’t and a stunned Truong is eliminated with O’Grady now up to 250,000 and a comfortable chip leader. Blinds are now at 1000/2000 with a 200 ante. The average stack is a touch over 108,000 or roughly 50 big blinds. The 14 remaining players are on a 10-minute break. With Tam Truong recently eliminated, his brother Thang is now trying to make his presence felt but he just donated a decent portion of his stack to Michael O’Grady. O’Grady loves a bit of talk at the table – in fact he is relentless – and he spoke his way through this hand after Truong limped in from UTG. “The most dangerous raise in the game – no raise at all! Be careful!” O’Grady said as he checked his option in the big blind. The flop came J-2-3 and O’Grady led for 3,000. Truong raised to 6,500 with O’Grady calling. The river was the 5 and this time O’Grady check-called a bet of 8,500. When Ace landed on the river, Truong bet 16,100 which actually forced O’Grady to pause for a minute to contemplate. Eventually he called and Truong immediately said “You win” as he tossed his cards into the muck. He is down to 60,000 while O’Grady moves to 180,000. Benjamin Zhang was one of the big stacks not so long ago but he has just become our latest casualty after copping an unlucky beat at the hands of Shivan Abdine. It was all pretty standard stuff for the most part, with Abdine opening the button and Zhang shoving for 30,000 from the big blind. Abdine didn’t waste too much time calling with A-Q but he would need help against Zhang’s A-K. The K-10-2 flop was a great one for Zhang, with Abdine needing a J to make the nut straight. The turn 9 didn’t change anything but poker is rarely a dull game and of course it was the J that fell on the river to send Zhang to the rail. Abdine is up to 110,000 after that hand, while Zhang’s bust-out means we are down to our final three tables with 18 players remaining. Peter Apostolou just had a heart flutter after calling an opponent’s all-in only to have the dealer grab his cards and throw them into the muck. Fortunately he had already tabled his Q-Q against his opponent’s Jacks and after a quick consultation with the floor staff, the board was spread. No Jack arrived and Apostolou moves into the outright chip lead with 180,000. Blinds are up to 600/1200 with a 200 ante. We have 23 players left. While most players jostle for position – some desperate for a much needed double-up – four big stacks have emerged as the countdown begins to the bubble. Michael O’Grady has been relentlessly aggressive and his crazy style combined with a bit of luck here and there has him atop the chip counts with 140,000. Just behind him is table mate Peter Apostolou with 135,000 while Lior Segre has 120,000 and Benjamin Zhang 100,000. At the other end of the spectrum, Jarred Graham, Michael Kanaan and Graeme Putt are among a group of extreme short stacks in need of some help! Play is back underway with blinds at 500/1000 with a 100 ante. We’ve reached the end of our ninth level which means players are now heading off on a 30-minute dinner break. It has been an eventful six hours of play, with the 99 players that started whittled down to just 30 remaining. Among those still in the hunt are Michael Kanaan, Jarred Graham, Martin Kozlov, Tam Truong, Jimmy Ghobrial, Ryan McKay, Graeme Putt, Michael O’Grady, Rhys Gould and Benjamin Zhang who will all be hoping to make a run when we return to play down to our final table. 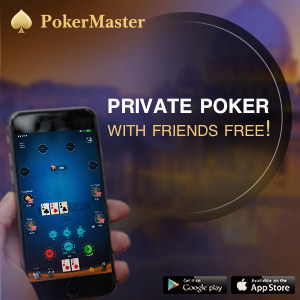 We’ll see you back here at Poker Media Australia in 30 minutes! Errolyn Strang boasts an impressive record here at The Star, having won the Sydney Championships main event back in 2011 and finished runner-up in last year’s NPL500 for cashes totalling over $200,000. She is back again this year hoping to make an impact and is starting to move up the leader board with around 60,000 in front. We just caught a hand in which she check-called a bet of 2,500 on an A-K-6 flop. The turn brought a 10 and Strang check-called a bet of 4,000. The river was the 9 and Strang when deep into the tank as her opponent bet 6,000. She eventually made the call and took down the pot with K-10 against her opponent’s K-Q. With 99 players taking their seats in today’s event, the top 12 will make the money with the winner to collect a cool $26,978 – not bad for a day or two’s work! Blinds are up to 400/800 with an ante of 100. We have 36 players remaining. Ryan McKay continues to build his stack and is closing in on 100,000 after forcing Michael Kanaan (pictured) to make a pained fold in a recent hand. The action started with Kanaan opening to 1,200 and McKay bumping it up to 3,300 on the button. Kanaan called and they saw a Q-7-3 flop. Kanaan then checked to McKay who bet 3,000. Kanaan called. The turn was a repeat 7 and this time Kanaan check-called a bet of 6,000. The river was a 10 and when Kanaan checked, McKay bet 20,000 which essentially put the former all-in. Kanaan tanked for a full minute before eventually throwing his cards into the much in frustration. McKay is up to 95,000 after that hand. With the board reading 2-2-Q-10-3 with four diamonds, Peco Stojanovski checked to Matt Rolfe who bet 7,500. He eventually went with his gut and made the call, but Rolfe turned over pocket Queens for the flopped monster. Stojanovski mucked his cards as he slips to 15,000. Rolfe is up to 45,000. As anyone who covers poker will tell you, a fast game is a good game and we’ve set a pretty decent pace here at The Star today. From a starting field of 99 players shortly after our 12.30 start, we are now down to 52 players remaining which means we are almost exactly halfway to our six-man final table. We’ve just witnessed a crazy cooler hand play out with Lior Segre the beneficiary. We didn’t see the pre-flop action but arrived at the table just in time to see the chips go flying. On a board reading K-7-9-8, Segre was one of three players to get all of their chips in the middle but although he held pocket Kings he needed help against the J-10 of George Kambouroglou. Incredibly the third player in the pot held pocket 9s, meaning Kambouroglou was in great shape to almost triple up. But the poker Gods had other ideas with the repeat 7 landing on the river to see one player eliminated, Kambouroglou crippled and Segre rocket up the leaderboard with 80,000 chips in front. Players are on their second 10-minute break of the day. When they return blinds will be up to 200/400 with a 50 ante. Jarred Graham is starting to build a stack and he just won a tidy pot at the expense of Victor Teng to add another 12,000-odd to his count. We caught the action on the flop as Graham checked to Teng on a 10-6-2 flop. Teng, renowned for his relentless aggression, bet 3,500 with Graham making the call. When a 7 landed on the turn, Graham check-raised all-in over Teng’s 6,125 bet with the latter quickly folding. Graham is up to 40,000. As tables have been gradually broken down, a “table of death” has been formed alongside our reporting couch (yes, we’ve set up on the lovely leather recliners that have recently been installed in the new poker room). From Seat 1, we have Tam Truong alongside Jarred Graham, Victor Teng, Martin Kozlov, Matt Rolfe and Tony Kambouroglou. We have a monster chip leader breaking away from the peleton with Ryan McKay stacking up a touch over 80,000 – not far off double that of his nearest rival! As McKay relayed to us, he has been gradually building his stack this afternoon but he accumulated some of his chips after playing an interesting hand against Australian Poker Hall of Famer Jason Gray and another opponent. After a raise and a call before him, McKay 3-bet to 4,000 with K-9 and was called by both Gray and the other opponent. The flop came K-10-8 and it was checked around. On the blank turn, McKay bet out with Gray shoving over the top for around 14,000 total. McKay made the simple call while Gray sheepishly showed 6-4 for the bluff. While he was in the midst of relaying this story to us, we also witnessed him playing another sizeable pot holding A-Q on an A-Q-7-Q-7 board. McKay bet 7,500 on the river and his opponent called but threw his A-K down in frustration when he saw McKay’s monster. He is looking good for a deep run today. We’ve been going for around three hours now and it’s good to see the players get into the spirit of short-handed play with 26 players already having been sent to the rail. Midway through Level 5 we’re down to 73 runners with blinds at 100/200 with a 25 ante. 2.55pm: 4-bet, 5-bet, 6-bet fold! Michael O’Grady is implementing a bit of power poker after just taking down a hand with a six-bet bluff. The action began with an early position limp, before O’Grady bumped it up to 800. An opponent behind made it 1,400 with O’Grady raising it up small again. When his opponent re-raised, O’Grady bumped it up to 10,100. His opponent thought for close to a minute before folding. O’Grady turned over A-6 which brought some surprised howls from his table mates. O’Grady is up to around 25,000. Players are back from their first 10-minute break of the day with blinds now at 100/200. We currently have 85 players remaining from the starting field of 99. Tucked away quietly at a corner table under his trademark hat, we almost missed the presence of Jarred Graham in today’s field. Graham, of course, recently became Australia’s latest WSOP bracelet winner when he won Event 31 – PLO Hi-Lo Split for a touch over $255,000. Graham also has a great record here in Sydney, where he won the inaugural Sydney Championships main event back in 2009. We look forward to seeing if he can add another trophy to the cabinet here this week. Aaron Benton jumped off a plane from Canada this morning and headed straight to The Star to take part in the Poker Media $1k Special, but his stay was short-lived – although without much sleep he doesn’t seem to cut up about it. We wandered past his table with the flop reading Qh-2c-2h and Benton betting 2,500. His sole opponent, ‘Toothpick’ Tony Kambouroglou, called. The turn was the 10h and Benton shoved for his remaining 4,000. Kambouroglou thought for 30 seconds before eventually making the call with A-Q. Benton turned over Ah-10s and would need either a 10 or a heart to stay alive. The river 4c wasn’t any of those and the 2009 APPT Sydney champion is off to take a nap! We’ve just entered our third level of the day with blinds now up to 75/150. In the past 40 minutes we’ve also seen the field grow to 94 starters with the likes of Tam Truong, Andy Lee, Joel Cohen and Milan Gurung taking their seats. Martin Comer has just exited the tournament area after clashing with Victor Teng (pictured). We caught the action on a flop of 8-6-Q and with around 8,000 in the middle. Comer thought briefly before shoving for 10,650, with Teng snap-calling. It was your classic cooler with Teng holding Aces and Comer K-K and when the board came running 10s it was all over for the elder statesman. Teng becomes an early chip leader after that hand with around 30,000. The Star poker manager Stephen Ibrahim has just made a major announcement regarding the upcoming Star Summer Series in December. 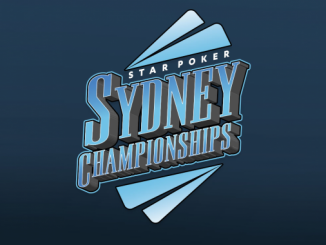 The flagship tournament series here in Sydney, this year’s Summer Series will see The Star team up with the National Poker League (NPL) to bring you the $2000 buy-in main event. Formerly known as the NPL 500, the main event will see players able to buy-in directly or satellite in either through the NPL or via The Star who will be running their satellites from October onwards. The NPL has already satellited in 150 players and it is hoped the final field will break The Star’s record field of 561 players that contested the inaugural APPT Sydney back in 2007 (won by The Star poker ambassador Grant Levy). A field of 575 would create a $1 million prize pool and the early talk is that we could even see a prize pool pushing $1.5 million. 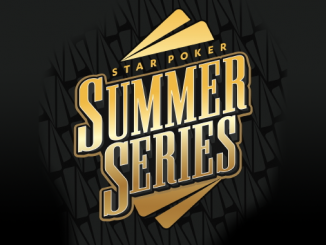 The Star Summer Series will kick-off in late November with the new main event scheduled for August 5-8. We look forward to seeing a record field assemble at The Star for what promises to be one of the most significant events in Australian poker history. 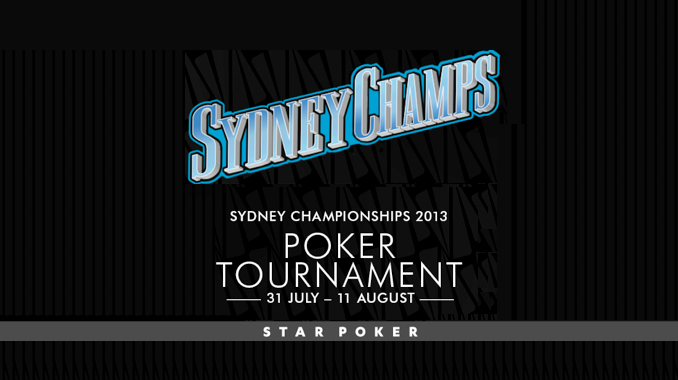 Welcome to Poker Media Australia and our coverage of the 2013 Sydney Championships live from Sydney’s recently renovated The Star. The Sydney Championships main event kicks off on Thursday night but before we get to that we’ve got today’s Poker Media $1k Special – Event 2 on this year’s schedule. The Poker Media $1k Special is slightly different this time around, being a 6-max event rather than full ring. We love the excitement of short-handed tournaments so we look forward to a day of fast action here in The Star’s new poker room. We currently have 67 entrants today although this event is nototious for having late buy-ins so there is every chance we’ll crack the 100. Among those we’ve spotted already at the tables are Aaron Benton, Michael Kanaan, Martin Kozlov, Graeme Putt, Stephen Baker, Mike Ivin, Victor Teng and Errolyn Strang. We’ll be here all day today bringing you all the action so stay tuned to Poker Media Australia.